By Joshua Gillin on Wednesday, December 30th, 2015 at 9:41 a.m. In May 2014, RightWingWatch.org posted this video of a 2012 Ted Yoho campaign stop in Ocala. A viral image on Facebook falsely accused U.S. Rep. Ted Yoho, R-Fla., of saying black Americans should only have three-fifths of a vote. 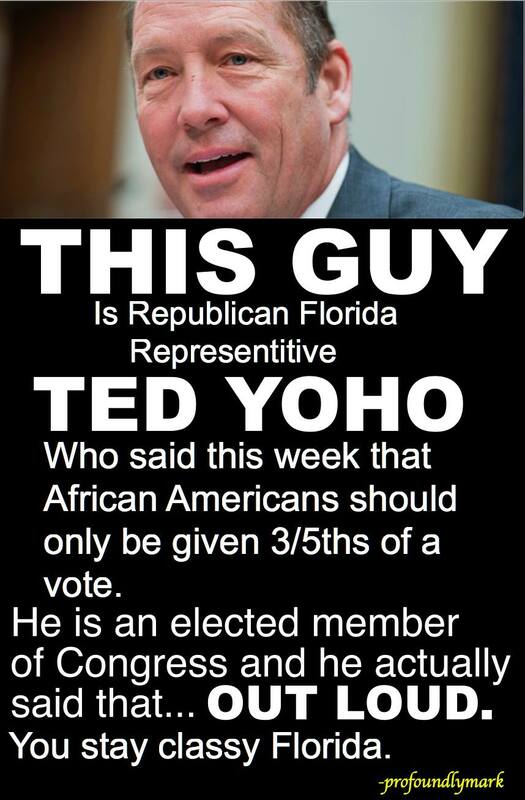 A curious reader pointed us to the image, which reads: "This guy is Republican Florida Representative Ted Yoho who said this week that African Americans should only be given three-fifths of a vote. He is an elected member of Congress and he actually said that… OUT LOUD. You stay classy Florida." We looked into it and found that there’s no evidence whatsoever that the Republican congressman said that. It appears that the meme’s creator was duped by a satirical website. We learned the image was from a Facebook user in California named Mark Kusler, who based it on a story on Politicalo.com. The website posts some real news, but it also posts satirical stories with exaggerated content. The site includes a "Show Facts" button that allow readers to highlight which parts of their stories are true and which are not. But the viral image — which has been shared more than 3,000 times — does not say any part of its message is untrue. So what’s the real story? On May 20, 2014, liberal website RightWingWatch.org ran a story about video footage from a stop at Berean Baptist Church in Ocala during Yoho’s 2012 congressional campaign (not last week, as the image said). During the appearance, Yoho blasted allowing an uninformed electorate into polling places and decried early voting through absentee ballots. He wrapped up by noting voting laws were much more restrictive in the past. "I’ve had some radical ideas about voting, and it’s probably not a good time to tell them, but you used to have to be a property owner to vote," he said in the video. He didn’t say anything about black voters, but the next day Politicalo.com made it appear Yoho said inner-city black constituents who rented their homes didn’t deserve to have the same voting power. Politicalo included Yoho’s actual comment about being a property owner. Then the site added a made-up quote: "The founding fathers didn’t have early voting, why should we? We need to go back to what the founding fathers intended. No early voting. No absentee voting. No renters voting. And a black man’s vote counts as three-fifths of a white man’s. It’s what God intended." The YouTube video of the appearance cuts off at the point where Yoho would have said the latter comments on Politicalo, which echoed the U.S. Constitution's three-fifths compromise of 1787 that allowed Southern states to count slaves as three-fifths of a person for the sake of representation and taxation. But we found no proof he actually said the United States should make African-American votes count less than white votes. An administrator from Politicalo pointed out to PolitiFact Florida that the quote was not highlighted by the "Show Facts" button, meaning it was fabricated by the post’s writer. People For the American Way, the parent of Right Wing Watch, confirmed to us that Yoho didn't say the things Politicalo added. That’s not to say Yoho’s comment about voters historically being property owners didn’t face some backlash. Democratic National Committee Chairwoman Debbie Wasserman Schultz said in 2014 that Yoho’s assertions "harken back to another century when Americans were denied their basic rights as citizens" and "should be roundly condemned in the strongest possible terms." Yoho spokesman Brian Kaveney told MSNBC in an email that "the congressman was making a reference to how voting was structured when America was in its infancy (from a historical perspective). He does not believe that this is the way it should be now." A viral image said Yoho said "African Americans should only be given three-fifths of a vote." There is no evidence Yoho said anything specifically about black voters in a 2012 campaign appearance in Ocala. The image was taken from a satirical news story on a satire site that twisted Yoho’s words about voting rights to make him appear biased against black voters. While Yoho has talked about reducing early voting, the post goes too far in using a fake quote to make it appear the congressman wants to strip away African Americans' civil rights. Published: Wednesday, December 30th, 2015 at 9:41 a.m.